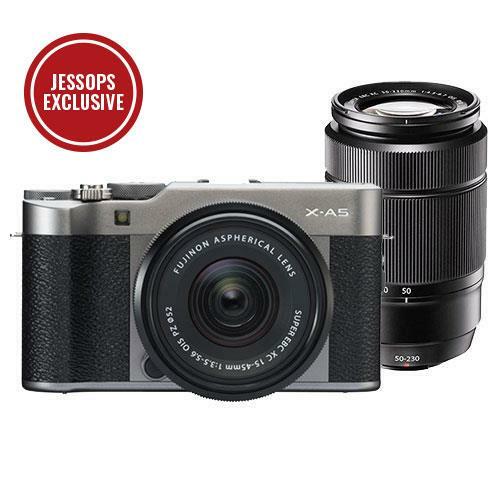 The Fuji X-A5 is a super-stylish 24.2 megapixel camera featuring a sleek aluminium body with leather finish. The slim lightweight design makes the camera easy to carry in your bag. The 180° Tilting LCD & Portrait Enhancer is perfect for Selfies and the X-A5 gives you an extended shooting capability of up to 450 frames per charge. The X-A5 can be connected to a smartphone using Bluetooth®, so sharing your photos is instant. The Fujifilm X-A5 features a 24.2MP APS-C sensor equipped with a phase detection autofocus system, and a newly-developed image processing engine that boasts processing speed 1.5 times faster than previous models. Rotating the LCD monitor 180° automatically activates the Eye Detection AF function which focuses on your eyes, letting you take stress-free selfies. The camera makes automatic adjustments to enhance skin tones for better portrait shots. The Eye detection AF function is automatically activated when you rotate the tilting LCD panel. The X-A5 can record a single moment in great detail, letting you use slow motion playback to witness what you missed with the naked eye. 4K, high-speed continuous shooting lets you record fast-moving objects. Choose the best shot from the 15 frames taken each second. Multi Focus mode automatically composes multi images to generate a sharp image with deep depth of field.